Glyn holds a Diploma of Performing Arts in Classical Trombone and a Bachelor of Music in Jazz Piano Performance. Glyn has performed in many countries as a jazz pianist including Beijing, Bangkok, Rome and Canada. He has also recorded 2 CD’s of original jazz with his own trio and quartet. Glyn teaches at the West Australian Academy of Performing Arts in both the jazz and contemporary faculties as a piano teacher and lecturer. He also teaches at Carey Baptist College in their specialist jazz course. 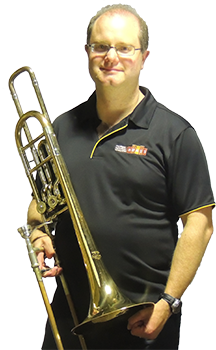 Glyn has played as principal trombone in the Perth Fortress Salvation Army and is the current principal trombone for RASWA. Wayne has returned to the band from a former stint in the trombone section of Channel Nine Brass in the eighties. He has been a member of all the various youth orchestras, brass bands, concert bands and big bands in Perth over the years and long-time associations with the symphony orchestra and brass band formats for the most part. Having always admired orchestral brass playing and teaching he recently completed WAAPA Diploma in Classical Bass Trombone and is now back at uni completing Bachelor Performance and Teaching degrees intending to start a new career choice.